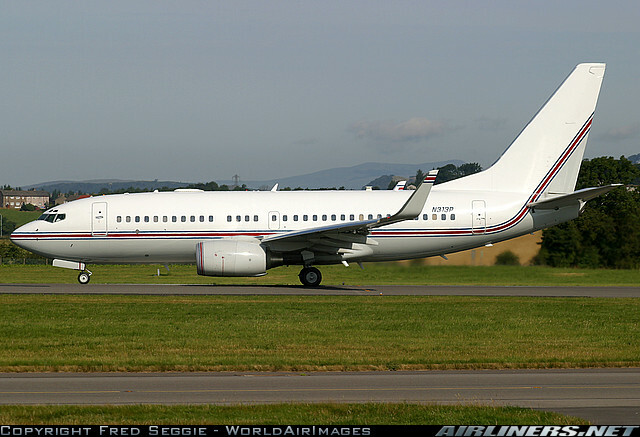 N313P is a Boeing 737-7ET executive jet that was owned by the CIA, although operated through a series of shell companies. The aircraft can be linked to multiple rendition circuits, including the rendition of ‘High Value Detainees’ between Afghanistan, Poland, Romania, Morocco and Guantnamo Bay in September 2003, the renditions of Binyam Mohammed from Morocco to Afghanistan and Khaled el-Masri from Macedonia to Afghanistan in January 2004, the rendition of Hassan bin Attash and Ali al-Hajj al-Sharqawi from Jordan to Afghanistan, also in January 2004, and the renditions of Abdel Hakim Belhadj and Fatima Bouchar from Thailand to Libya, via Diego Garcia, and of Yunus Rahmatullah and Amanatullah Ali from Iraq to Afghanistan in March 2004. At the time of the September 2003 rendition flight of High Value Detainees, the aircraft was registered to Stevens Express Leasing, a CIA shell company. It was operated by a nominally independent company called Aerocontractors which in fact worked exclusively for the CIA. By January 2004, when the renditions of Binyam Mohammed and Khaled el-Masri took place, the ownership of the aircraft had been transferred to Premier Executive Transport Services, another CIA shell company, also operated by Aerocontractors. Trip planning services for these renditions were provided be Jeppesen Dataplan, which also filed dummy flight plans to try and disguise the September 2003 renditions and those of Binyam Mohammed and Khaled el-Masri in January 2004. In November 2004, the aircraft was re-registered with tail number N4476S, to a company called Keeler and Tate Management LLC. It changed hands again in August 2006, and has since been registered to MGM Mirage AcH LLC, with tail number N720MM.